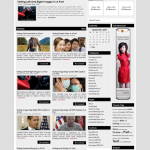 Remode is a 3 columns fixed width WordPress theme by MagPress.com. This WordPress template has featured content slider, featured categories, Adsense ready, etc. What a great guy Ronald is! He took the time to email me the directions to accomplish exactly what I wanted to do with the theme. Thank you so much for your theme ….. and your help! First, let me thank you for such a nice theme! Is there a way to insert a text area (text box) just above the thumbnails for the posts … that would be the width of the 2 columns of thumbnails?